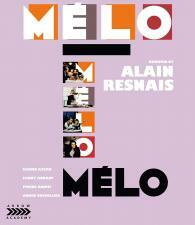 Master director Alain Resnais (Last Year At Marienbad) blurs the line between cinematic technique and theatrical artifice in his acclaimed Mélo, adapted from Henri Bernstein s classic play about a doomed love triangle in 1920s Paris. Pierre (Pierre Arditi, Love Unto Death) and Marcel (André Dussollier, A Good Marriage) are both celebrated concert violinists and lifelong friends, in spite of their differing temperaments. Pierre is modest, sensitive and content with his lot; Marcel is hungry, driven, and pursues a solo career that takes him to the four corners of the world. After years apart, the two friends reunite when Pierre invites Marcel to his home for dinner. It is then that Marcel first meets Pierre s wife Romaine (Sabine Azéma, Cosmos), sparking a passionate affair that can only end in tragedy before the curtain falls. As thrillingly intimate on film as it was on the stage, Mélo s César award-winning cast and inventive direction are highlighted in a stunning new restoration, revealing a hidden gem in Resnais celebrated body of work waiting to be rediscovered.